Humidifier is an equipment used to increase the relative humidity of a room to ensure that the dry space has enough moisture for the comfort of the occupants. This happens often during winter when the heater is turned on causing the relative humidity of the air in the house to decrease. The relative humidity(RH) shows the percentage of moisture in the air and different room temperature can hold different amount of moisture. Air that is low in RH will tend to absorb water vapor from the surrounding including the people inside the room. This can cause discomfort to the nose, mouth, eyes and throat. It can also cause damage to the furnishing in our homes such as causing the wood to shrink and cracks. Too much moisture can also cause problem such as mold growing on moist surfaces. On top of that unpleasant smell and the feeling of dampness inside the house also cause discomfort to the occupants. This situation is bad for our health hence when this happens, you will need to have a dehumidifier to remove the excessive moisture from the air. A study shows that the typical RH that is comfortable to the human body is between 30% to 50% RH. The typical equipment used is the evaporative type and consists of a reservoir of water, wick, fan and basic humidistat control. Some higher end unit has heater to reheat the humidified air before being discharged to the room. Indicators to indicate the ON/OFF status of the unit and the need to top up the water are sometimes included. Find out other types of device that you can purchase from the market. Spray Type consists of a chamber that contains spray noozles, tank to hold water and a water pump that circulates the water. The incoming air that enters the chamber is forced to be in contact with the water that is sprayed from the nozzles causing heat transfer between the water and the air. Humidification occurs when the temperature of the water is higher that the dew point of the air. Ultrasonic Type has a piezo transducer that that is vibrated at ultrasonic frequency. This causes the water droplets to breakdown in smaller size and into fine mist which is then discharged to the room by the use of the blower. The diameter of the mist is typically 1 um. 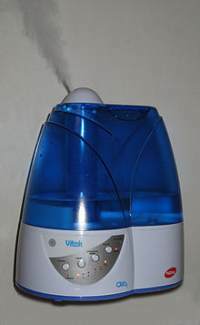 Steam Type is sometimes called vaporizer and it basically boil the water and discharge the steam into the room. It usually consists of a metal reservoir to contain the water, a heater element and a float. The float is used to regulate the water that comes in from the household water supply. Once power is supplied to the device, the heater will heat up speedily and cause steam to be produced which moisturizes the warm air passing over it. The moist air is then discharged to the room and humidity of the room will increase. Bypass Type typically consists of an evaporator pad, motor, drain valve, float, water tank, rotating disc and overflow line. The evaporator pad is connected to the rotating disc which enables the pad to dip into the water to absorb the moisture. Warmer air that comes in passes over the rotating pad causing the moisture to evaporate and hence humidify the air. The moist air is then directed back to the space which need to be humidified. The reservoir of the tank that hold the water should be regularly clean to remove the residue due to the impurities of the water used. The mineral deposits can be cleaned by using a using one part of vinegar with one part of water. If possible, try to use some filtration system to ensure that the water used contains minimal impurities. Also read the manufacturers recommendation on the maintenance of the equipment to ensure continuous operation. Those that have piping installation should be constantly checked to ensure that there is no leaking on the joints of the pipes.